Luna, or at the time Katie, was one of a few dogs that a shelter had taken to our local PetSmart for the day to get them noticed, and hopefully adopted. I turned the corner and spotted her in a crate at the end of an aisle. We locked eyes and I went over to give some scritches. 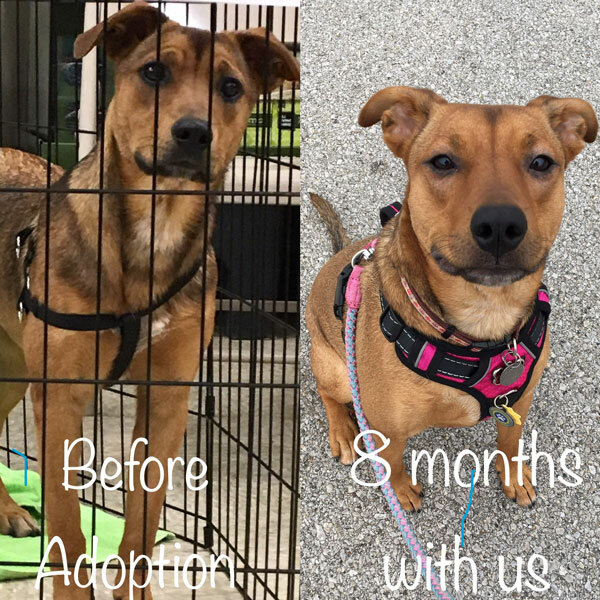 It was then I learned that she was only 6 months old, had previously been adopted (3 separate times) and brought back. The complaints were she was energetic and didn’t like people’s cats. However, after taking her home and seeing how she reacted with males, we suspect some abuse as well. She’s been with us for 8 months now, and I can’t find a reason anyone would have returned her. She’s my nap partner, my TV buddy, and a lovely girl who loves playing with her brother. Don’t always listen to what people say is wrong with a dog.